The green output connector in the header triggers when the click has been performed. The title of the block (“Click Web Position”) can be changed by double-clicking on it and typing in a new title. The position to click in X, Y coordinates. The top-left corner of the browser window’s canvas is position 0, 0. 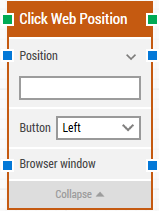 Please note that clicking an exact position is only partially supported by browsers. For instance, if you click on a position inside a horizontal slider (<input type=”range” … />) the click will simply be sent to the input control and handled as a click on the entire control — not in a specific position. Select which button to click using, and if it should be a single or double click. By default, the left mouse button is selected.